Agriculture consumes about 80 percent of all U.S. water. Making fertilizers uses 1 to 2 percent of all the world’s energy each year. 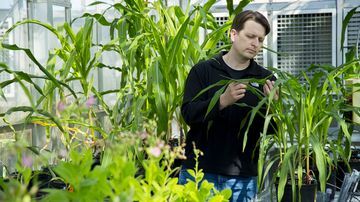 A new program hopes to develop better crops — super plants that are drought-resistant, use less fertilizer and remove more carbon dioxide from the atmosphere. Graduate students and early-career researchers from around the world are gathering at the University of New Mexico for the 2015 Sandia National Laboratories Nonlinear Mechanics and Dynamics Summer Research Institute. The University of New Mexico Human-Centric Security Initiative presents, “Projecting the Integrity and Confidentiality of Security Functions Through Provable Code Obfuscation,” on Friday, Jan. 23, from 3-5 p.m. in Centennial Engineering Center, room 1044, on the UNM campus.